It’s the school holidays and there is no better time to get out the games! Crown & Andrews and Goliath Games have released some great new games which are perfect for the family and kids of all ages. One of my personal favourites is Yeti in my Spaghetti. This is very much like Jenga but with noodles! To play, noodles are laid across the bowl and the Yeti is placed on top of the noodles. You remove the noodles one by one trying not to let the Yeti fall into the bowl. If you make the Yeti fall in the bowl you lose! This is a really fun game that’s great for little kids (Suitable For ages 4+) right through to adults. 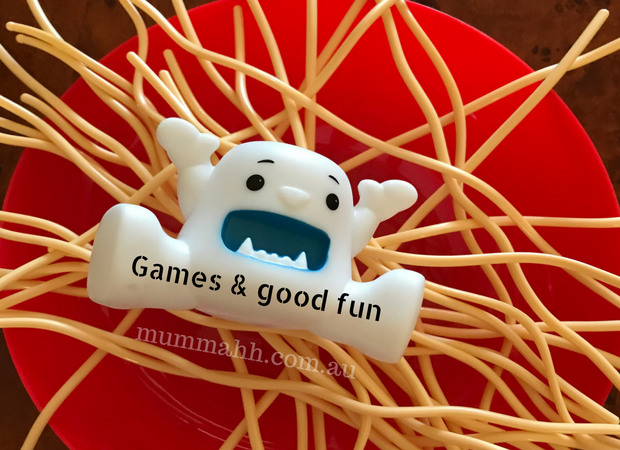 Yeti in my Spaghetti is RRP $39.95 and available exclusively at Big W.
If you like card games then try the new generation with Shuffle. Shuffle is the new range of interactive card games based on family classics! By downloading the relevant app to your phone or tablet, Shuffle can bring a fun new dimension to Twister, bring Chance cards to life in Monopoly, produce or create customised pictures of your friends and family using the Guess Who? imagery. There are a few new releases too including Monopoly, Monopoly Junior, Trivial Pursuit, My Little Pony, Operation, Guess Who? Cluedo, Connect 4, Boggle and The Game of Life. Shuffle is suitable for various ages depending on the individual games, just check the pack. RRP $19.95 each. SQUAWK has everything kids love in a game! This game is hilarious but beware, don’t play it if you have a headache because the name is exactly what this game is about. Kids will love this game because it’s got lots of squawking, poking and is hilarious. You spin the spinner to see how many times you can poke the chicken to make her lay an egg. After a random number of pokes the chicken will flip out – bursting open her henhouse and SQUAWK-ing loudly as she lays an egg. Crack the egg open to see if you’ve hatched an egg or a chick. The player with the most chicks wins! Squawk is RRP $ 39.95 and suitable for ages 4+. A ball you can take anywhere – and it fits in your pocket. Port-A-Ball features a specially patented valve which allows instant inflation and deflation. With one large breath of air your Port-A-Ball is ready for use anywhere you go. Available in 4 awesome colours, it makes an excellent pocket money toy! RRP $10.95, suitable for ages 5+. Available at all leading retailers. Who doesn’t love fairies and fairy gardens? The FLOWER FAIRIES: Secret Garden range is something I would have loved when I was little. Cicely Mary Barker’s Flower Fairies™ have been enchanting children since 1923. The Flower Fairy Secret Garden Range brings these magical characters to life where you can create your very own fairy wonderland! The Flower Fairies Secret Garden range includes small and large figurines, fairy and garden decor accessories plus garden kits. RRP varies from $10.95, suitable for ages 6+. Available at all leading retailers. The Game of Things is the ultimate “who-said-what” game. The game presents players with provocative questions such as “Things… you wouldn’t do for a million dollars”, “Things… you wish grew on trees”, or “Things… your parents forgot to tell you”. Simply pick a topic, have all players write a response, then read them out loud and guess who said what. There are no right or wrong answers, just a whole lot of laughs! RRP $39.95, suitable for ages 14+. You’re sure to find something amongst these to keep the kids (and adults!) amused.